I believe it was Virgil who said, “They are able because they think they are able.” When I say I believe, what I really mean is that I googled famous sayings and found it waiting there for me. Saying ‘I believe’, is simply me having delusions of well read. I seem to remember Stevie Wonder saying, “We all have ability. The difference is how we use it.” It was a warm day in June I believe. Ok, I made that last part up. Back in the day, I used to hang out with David Bowie and Boutros Boutros Ghali, at a club in London. It was a moist evening and Bowie was passed out near the juke box, which was playing ‘Spiders from Mars’. While doing shots with a small band of traveling circus folks, Boutros said, “If at first you don’t succeed, form a committee, discuss things at length, and…”. He became distracted by the bar maid, then continued, “..and…what was I saying?...oh yes…Can I get another freaking round of jello shots!” Jimmy the ‘Monkey Boy’, looked confused, until I explained that this was the closest he had ever come to having a coherent thought. The evening ended badly, when Bowie awoke and decided he wanted to ride an elephant. Obviously I have run amok on the ole keyboard and can’t be trusted to tell a story without embellishment. And by embellishment I mean complete fabrication. I digress. Sometimes that happens when one is filled with Olympic spirit and lean pockets. I had a wonderful couple of hours of woodworking this evening. There were several tasks I wanted to complete. First of all I needed to cut the 3/8th inch threaded rods with an ancient hacksaw. After the rods are cut, the next step is to put them into the stretchers. Once all the stretchers are ready to go, I needed to drill a 3/8th inch hole for the dowel pegs. The dowel pegs are used on the top half of each stretcher to keep the stretchers vertical and aligned when the legs are assembled. The last task on my list was to assemble the legs. Because I have already done all of these steps during the construction of my workbench, I am able to see how I have progressed as a woodworker. Getting to this stage the first time, took 3 weeks, compared to less than a week this time. The holes I have drilled, despite their issues, were much easier with my new Bosch drill bits. Each step was easier because I had a workbench. Just having that vice makes life so much easier. The routing portion was less scary because of the jig I created. Every aspect has been faster, more accurate, and more enjoyable. I have completed the legs for my router table. Victory is mine. The next steps will be to lay out the top of the table. I must decide if I want to use 1 or 2 sheets of ¾ inch ODF. Buy a piano hinge. Mark and cut out the opening for the router plate. Route out a channel for the T track. Install the plate and drill out the holes for router. Then I will figure out what I am going to build for a fence. It is clear that I still have a bunch of work to do, but I am excited, because these next steps are going to be new territory for me. The installation of the router plate and the drilling the holes scares me a little, but I will figure it out. When combined, each of these little triumphs, give me confidence. I do feel I am able, and as I have completed all the tasks, have proven that it is so. Virgil was correct. So I am done for the night, time to kick back, watch Olympics and possibly listen to ‘Changes’. this is looking good . to the edge of the bit . and use a rabbeting bit for the edge rabbet . I have a guinea pig bit, two hamster bits, and a lovely groundhog bit, but I don’t have a rabbet bit yet. I guess I will need to pick one up. What in the name of woodworking is ODF? I think it is the same as MDF, but they called it ODF and charged me more at the lumberyard. Obviously ODF is one letter better than MDF. .... and, hopefully, its not OSB. by the width of the rabbet . the edge of that is the base plate size . sorry , i’m still dreaming of luna ! The ODF optional density fiberboard) is better than the MDF (medium density fiberboard) but for the really best you should get the PDF (Premium Density Fiberboard). It seems the computer industry keeps stealing our woodworking terminology….Routers, pdf. etc. I don’t think I’ve ever seen a carpeted workshop before. Do you use a shop vac or a Hoover? Thanks for the explanation. It is good to know they didn’t make it up and charge me more. I use a shop vac and occasionally a Dyson. Thanks for the vote of confidence notottoman. Though I think that museum quality pieces are a ways off, how about I try for garage sale pieces first? Employing a specific web search, I found no information on any material called or specifies to be ODF or optional density fiberboard. Is this possibly a house brand marking? If this is really a new material or a better sort of MDF or HDF I’d like to know about it because improved materials are of great interest to me. Can someone provide a link to a manufacturer or retailer that specifies ODF? Your table looks very good so far. My suggestion would be to go for a 1-1/2” top thickness so it doesn’t “belly out” with the weight of your router. Man made platters are not very rigid. 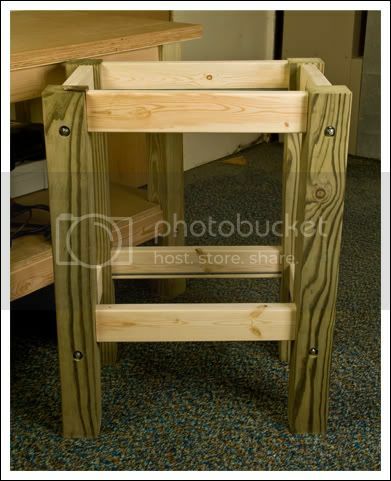 Personally I would rather use two layers of 3/4” plywood, but the ODF is a lot less expensive and will work fine. When you rout the opening you can just rout a little way through, say 1/4” and then drill a hole and saw through with your saber saw leaving a rough rim to be finished off with the router afterward. It’s faster with less noise and dust and saves some strain on your router and bit. I think you are right about the 1-1/2” thickness. I wasn’t aware of ODF being not as good as plywood. I am not married to the idea of using ODF, I just happen to have some. I may have to rethink my wood choice for the top. I will ask for more information at the lumbaryard next time I am there.